What is it about pumpkin spice lattes that make America go crazy each year. It isn’t like pumpkin spice isn’t available all year long. But for some reason, the popular coffee shop has made us all drooling for the first day of fall at their stores so we can get our hands on a pumpkin spice latte. Well, I mastered my own crock pot pumpkin spice latte. Add a little RumChata to take it up a notch for a warm fall cocktail. Brewed coffee with milk and cream with actual pumpkin plus pumpkin pie spice brings this drink to life and singing the flavors of fall. Wanting to make it a little stronger, add a shot of RumChata. I am telling you, people, it is ah-making. It is as if RumChata was made to be in pumpkin spice latte. Last weekend we hosted a wedding reception on our farm. Yes, behind our house was a 100′ by 40′ tent. That is what you call love for someone. As we prepped for the wedding reception, my girlfriend and I sucked these down since it was a chilly day with wind an drizzle. Knowing the crock pot was keeping these crock pot pumpkin spice lattes warm as worked was incredibly motivating. I even use leftover coffee from my morning brew for these lattes if I am making them in the afternoon. The combination of milk, coffee, pumpkin, and spices slowly cook to make these flavorful pumpkin spice lattes. The shot of RumChata in the latte happened by accident. I am telling you, by accident. Maybe. 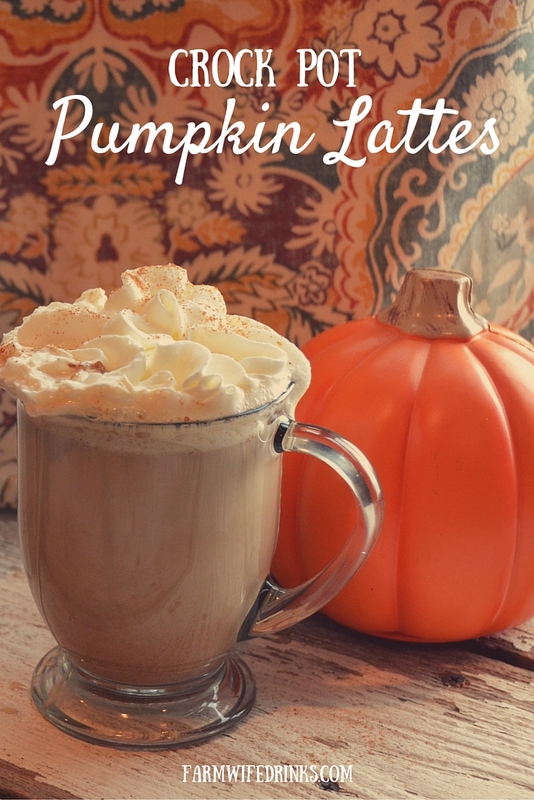 Regardless, these pumpkin lattes are amazing with our without the RumChata. If you have leftover coffee from this morning, don’t dump it out. Just go dump it in the crock pot and add the rest of the ingredients. Enjoy the warm flavors of pumpkin and Rumchata in your very own kitchen with the help of your crock pot. This crock pot pumpkin latte with RumChata recipe is simple to make. Pour the coffee, milk, cream, pumpkin, sugar, vanilla, and pumpkin pie spice into a crock pot. Cook on high for an hour and stir. Turn to low and continue to cook until hot. Ladle into mugs. Leave room for a shot of RumChata if using and add RumChata to the mugs. I don’t drink coffee but I love pumpkin spice and use it throughout the year in things like protein shakes, oatmeal, and cold cereal. I’ve even put it on fried eggs, yum. So, since I love pumpkin so much, and this has LOTS of milk, I may have to actually try it. I get 6-8 mugs full depending on the size of the cup you are using. If you want a stiffer drink, I would add some vanilla vodka! Could you add Bailey’s instead of Rum Chata? Do you think it would be an issue to go ahead and add the Rum Chata to the pot if I’m taking this to a party? I would label it so that everyone knows it is spiked. Also, if I were to add the vanilla vodka in addition how much would you add…that just sounds so yummy! I would add a half cup of vanilla vodka and go ahead and add it all to the crock pot!